Draft: 2005, New York Yankees, 8th rd. Full name: AUSTIN JARRIEL JACKSON...Married, Jonna...Is a 2005 graduate of Billy Ryan High School in Denton, Texas … Also played basketball …Ranked 10th among the nation's senior point guards by Athlon Sports...In 1999, was named by Baseball America as the best 12-year-old baseball player in the nation … Named by the same publication as the best 15-year-old baseball player in 2002... Was rated by Baseball America as the No. 14 Draft Prospect among high school players in the nation. Spent his first season with Cleveland and played 85 games around two stints on the disabled list...His .318 season batting average was the fifth highest mark in the American League among players with at least 250 plate appearances...Hit .352 (46-for-158) off left-handed pitching after hitting just .159 in 2016...Suffered a hyperextended big toe on May 1 at Detroit and missed 20 games from May 2-25... also missed 22 games with a quad strain, June 27-July 24...Collected his 1,000th career hit on June 24 vs. Minnesota (off Kyle Gibson)...Made 38 starts in center field, 29 starts in left field (38 games) and 12 starts in right field (18 games)...Was a non-roster invitee to Cleveland's big league camp. Spent the season with the White Sox, hitting .254 (46-181) with 12 2B, 2 3B & 18 RBI in 54 games, including a mark of .364 (16-44) with RISP...He did not play after June 9 due to a torn meniscus in his left knee that required arthroscopic surgery on June 15...Was Chicago's Opening Day center fielder and made 52 starts in center for the Sox. Hit .300-plus in June (.304) and August (.314)...Recorded his 11th and 12th career leadoff homers on 4/19 vs. Texas and 7/26 vs. Toronto...Connected on first career grand slam on 7/7 vs. Detroit (Kyle Ryan)... Was traded by Seattle with cash to the Cubs for a player to be named later on 8/31... Recorded a career-high 5 RBI on 9/30 at Cincinnati... Appeared in 5 postseason games, going 0-8. Split season between Detroit and Seattle after being acquiredon July 31 as part of 3-team dealthat sent INF Nick Franklin to Rays... Appeared in 154 games, 151starts in CF, hitting .256 (153x597) with 71 runs, 30 doubles, 6 triples, 4home runs, 47 RBI, 20 steals... Hit .229 (51x223)with 19 runs, 5 doubles, 1 triple,14 RBI in 54 games with Seattle;hit .273 (102x374) with 52 runs, 25doubles, 5 triples, 4 home runs, 33RBI in 100 games with Detroit... Hit .299 (52x174) with 9 doubles, 1 triple, 1 home run & 14 RBI versus left-handers; .239 (101x423) with 21 doubles, 5 triples, 3 home runs & 33 RBI against righties... Hit .299 (86x288) with .750 OPS at home; .217 (67x309) on road... From June 5-Aug. 31, hit .295 (88x298) with 42 runs, 16 doubles, 4triples, 1 home run & 23 RBI in 75 games; hit .191 (21x110) in ﬁnal 27 games (Sept. 1-28)... Recorded his third career season with 30+ doubles (34 in 2010, 30 in2013) and his third season with 20+ steals. Completed his fourth season with the Tigers in 2013, playing in 129 games...Ranked fifth in the American League with 99 runs scored and seven triples...Tabbed the third-best defensive outfielder in the American League by Baseball America...Collected a season-high four hits on April 14 at Oakland -- matched the high with four hits on July 4 at Toronto and on August 9 at New York's Yankee Stadium...Sidelined May 13-June 13 with a strained right hamstring...Assigned to Triple A Toledo for an injury rehabilitation assignment on June 10 -- batted .231 (3x13) with a run scored and one RBI in three games with Toledo...Compiled a season-best 10-game hitting streak June 15-26, batting .462 (18x39) during that stretch...Appeared in his 500th major league game on June 30 at Tampa Bay...Batted .339 (19x56) with 14 runs scored, two doubles, two home runs and seven RBI in 15 games during June...Established a career high with four runs scored on July 4 at Toronto...Matched a career-high with three doubles on August 9 at New York's Yankee Stadium...Named the Co-American League Player of the Week for the Week ending August 11 -- marked the second Player of the Week honor of his career...Batted .280 (35x125) with 25 runs scored, five doubles, three triples, five home runs and 13 RBI in 30 games during August -- led the American League with 25 runs scored, while he was tied for first with three triples during that stretch...Matched a career-high with four RBI on September 6 at Kansas City...Batted .214 (34x160) with four home runs and 10 RBI with lefties on the mound...hit .296 (116x392) with eight home runs and 39 RBI against righthanded pitching...Hit .267 (67x251) in 63 games at Comerica Park...batted .276 (83x301) in 66 games on the road...Batted .280 (75x268) in 63 games prior to the All-Star break... hit .264 (75x284) in 66 games following the break. Completed his third season with the Tigers in 2012, establishing career highs with a .300 batting average, 16 home runsand 66 RBI. ... Topped the American League with 10 triples, while he tied for fifth with 103 runs scored and tied for eighth with a .377on-base percentage. ... Finished the season with 29 doubles, 10 triples, 16 home runs and 12 stolen bases -- marked the 19th time a Tigersplayer has posted double-digit totals during a single season in those four categories...he is the fifth player in franchisehistory to accomplish the feat in multiple seasons, joining Bobby Veach (1920, 1921), Ty Cobb (1921, 1925), CharlieGehringer (1929, 1930) and Curtis Granderson (2007, 2008). ... Tabbed the third-best defensive outfielder in the American League by Baseball America. ... Collected a hit on both the first pitch and last pitch the Tigers saw on April 5 versus Boston -- according to STATS LLC,he is the first Tigers player to do so in a game since Gary Pettis accomplished the feat on July 29, 1989 versusMinnesota. ... Finished with a season-high four hits on April 8 versus Boston -- matched the high with four hits on April 27 at NewYork's Yankee Stadium, May 1 versus Kansas City, June 28 at Tampa Bay and August 5 versus Cleveland. ... Led off the game on April 16 at Kansas City with a home run off Danny Duffy, his fifth career lead-off home run --connected for a lead-off home run five more times during the season, doing so on May 6 versus the Chicago White Sox(Dylan Axelrod), July 15 at Baltimore (Miguel Gonzalez), July 30 at Boston (Clay Buchholz), August 11 at Texas (DerekHolland) and September 22 versus Minnesota (Samuel Deduno). ... Sidelined May 17-June 9 with an abdominal strain. ... Hit .400 (22x55) with four doubles, a triple, two home runs and 10 RBI in 15 games during May. ... Assigned to Triple A Toledo for an injury rehabilitation assignment on June 7 -- batted .125 (1x8) in two games withToledo. ... Established a career high with a 16-game hitting streak June 24-July 13 -- batted .391 (27x69) with two doubles, three triples, two home runs and eight RBI over the course of the streak. ... Scored a run in 13 straight games June 30-July 16 -- longest such streak by a Tigers player since Johnny Groth alsoscored a run in 13 consecutive games August 14-26, 1950. ... Selected the Tigers Player of the Month for June -- hit .317 (26x82) with six doubles, a triple, three home runs and 17RBI in 20 games during the month. ... Equaled a career high with four RBI on July 21 versus the Chicago White Sox. ... Batted .304 (31x102) with two doubles, two triples, three home runs and 13 RBI in 26 games during July. ... Connected for the first inside-the-park home run of his career on August 10 at Texas -- first inside-the-park home runby a Tigers player since Curtis Granderson did so on August 26, 2007 versus the New York Yankees...Jackson addeda triple in the game at Texas to become the first Tigers player with both a triple and an inside-the-park home run in thesame game since Steve Kemp did so on September 4, 1977 versus Oakland. ... Batted .332 (84x253) in 64 games prior to the all-star break...hit .272 (79x290) in 73 games following the All-Star break. Completed his second season with the Tigers in 2011, establishing career highs with 11 triples and 10 home runs...Tied for the lead in the American League with 11 triples -- first Tigers player to lead the league in triples since Curtis Granderson did so with 13 triples during the 2008 season...second in the league with 181 strikeouts, while he tied for fourth with 14 sacrifice hits... Finished the season with 22 doubles, 11 triples, 10 home runs and 22 stolen bases -- marked the 18th time a Tigers player has posted double-digit totals during a single season in those four categories...he is first Tigers player to accomplish the feat since Curtis Granderson did so in both 2007 and 2008...Compiled a career-best 12-game hitting streak May 6-20, batting .346 (18x52) with five doubles, two home runs and eight RBI...Established a career high with four RBI on May 9 at Toronto...Led off the game on May 13 versus Kansas City with a home run off Luke Hochevar, his third career lead-off home run -- connected for his fourth career lead-off home run on August 25 at Tampa Bay off Jeremy Hellickson...Collected two triples on June 11 versus Seattle to establish a career high -- matched the high with two triples on September 3 versus the Chicago White Sox...Batted .291 (32x110) with three doubles, four triples, a home run and nine RBI in 28 games during June...Tabbed the American League Player of the Week for August 29-September 4 -- hit .529 (18x34) with 13 runs scored, three doubles, three triples, two home runs and five RBI in seven games during the week...Collected a season-best four hits on August 31 versus Kansas City -- equaled the best with four hits on September 3 versus the Chicago White Sox...Hit .271 (76x280) in 75 games at home...batted .228 (71x311) in 78 games on the road...Collected three hits in Game Three of the American League Championship Series on October 11 versus Texas -- matched the franchise record for hits by a Tigers player during an American League Championship Series game. In his first season with the Tigers organization in 2010, he topped all American League rookies with 103 runs scored,181 hits, 247 total bases, 48 extra-base hits, 34 doubles, 10 triples and 27 stolen bases....Named the American League Rookie of the Year by The Sporting News, as well as being tabbed the American LeagueOutstanding Rookie in the Players Choice Award balloting....Selected to the TOPPS Rookie All-Star squad..Tabbed the Detroit Sports Broadcasters' Association Tigers Rookie of the Year....Tied for second in the American League with 10 triples, while he tied for sixth with 103 runs scored and finished ninthwith 618 at-bats and 181 hits...led the league with 170 strikeouts....Became just the fourth player in major league history since 1901 to collect at least 100 runs scored, 180 hits, 30doubles, 10 triples and 25 stolen bases as a rookie -- joined Joe Jackson (1911), Juan Samuel (1984) and HanleyRamirez (2006) in accomplishing the feat....Scored 103 runs to become just the sixth rookie in Tigers history to score at least 100 runs -- his 103 runs scoredmarked the most by a Tigers rookie since Barney McCosky scored 120 runs in 1939....His 181 hits marked the most by a Tigers rookie since Harvey Kuenn finished with 209 hits in 1953....Registered 16 games with three-or-more hits, marking the most by a Tigers rookie since Harvey Kuenn finished the1953 season with 21 such games....Made his major league debut for the Tigers on April 5 at Kansas City, hitting lead-off and playing center field -- firstTigers player to bat lead-off in his major league debut on Opening Day since Jake Wood did so in 1961, while hebecame the first Tigers player to make his major league debut on Opening Day as the starting center fielder sinceBarney McCosky did so in 1939....Collected his first major league hit on April 5 at Kansas City, a run-scoring double off Robinson Tejeda....Led off the game on April 25 at Texas with his first major league home run off Colby Lewis -- connected for his secondcareer lead-off home run on August 17 at Yankee Stadium off New York's CC Sabathia....Compiled a 10-game hitting streak April 28-May 9, batting .478 (22x46)....Collected a career-high five hits on April 30 versus the Los Angeles Angels of Anaheim -- became the first Tigersrookie with five hits in a game since Curtis Granderson did so on September 18, 2005 at the Los Angeles Angels ofAnaheim....Tabbed the American League Rookie of the Month for April after hitting .364 (36x99) with 20 runs scored, six doubles,two triples, a home run and seven RBI in 23 games -- led all American League players with 36 hits during the month,while he finished third with a .364 batting average and tied for third with 20 runs scored....Established a career high with an 11-game hitting streak June 26-July 7, batting .333 (15x45)....Recorded a 10-game hitting streak July 16-25, batting .444 (20x45)....Hit .314 (32x102) with 16 runs scored, seven doubles, four triples and six RBI in 24 games during July....Batted .317 (144x454) versus righthanded pitchers -- 10th-best in the American League...hit .226 (37x164) versuslefthanded pitchers....Hit .310 (92x297) in 75 games at home...batted .277 (89x321) in 76 games on the road....Tied for eighth among all American League outfielders with nine assists. Named the International League's Rookie of the Year with Triple A Scranton/Wilkes-Barre as he led the league with ninetriples during the 2009 season...Second in the International League with 151 hits, while he finished third with 504 at-bats and tied for third with 132games played...Selected to the International League's mid-season all-star squad...Tabbed the best hitting prospect in the International League by Baseball America...Hit .386 (17x44) over a 10-game hitting streak April 9-25...Sixth in the International League with a .371 batting average (23x62) in 16 games during April...Compiled an 11-game hitting streak May 17-28, batting .395 (17x43) with four doubles, a triple and seven RBI...Seventh in the International League with a .339 batting average (37x109) in 30 games during May...Batted .320 (8x25) with three doubles and two RBI in seven games during the International League playoffs...Named the third-best prospect and best defensive outfielder in the Tigers organization following the season by BaseballAmerica. Earned Eastern League mid-season all-star honors as he spent the entire 2008 season with Double A Trenton...Second in the Eastern League with 520 at-bats, while he tied for third with 148 hits and tied for fourth with 75 runsscored and 33 doubles...Tabbed the best defensive outfielder in the Eastern League by Baseball America...Compiled a season-high 12-game hitting streak April 12-23, batting .340 (18x53)...Collected a season-best seven RBI on May 21 at Reading -- equaled the high with seven RBI on June 1 at New Britain...Tied for third in the Eastern League with five home runs during June, while he tied for fourth with 21 RBI...Batted .553 (21x38) over an 11-game hitting streak July 11-24...Tabbed the Eastern League Player of the Week for July 14-20 after hitting .643 (9x14) with three doubles, a home runand two RBI in four games...Tied for seventh in the Eastern League with a .330 batting average (35x106) in 28 games during July...Sidelined August 23-30 with a left lumbar spine muscle strain...Selected the Most Valulable Player of the Eastern League playoffs after hitting .259 (7x27) with two doubles, two homeruns and seven RBI in seven games as Trenton captured the league's championship...Named the top prospect in the Yankees organization and 10th-best prospect in the Eastern League following theseason by Baseball America...Saw action in 28 games for Peoria in the Arizona Fall League following the season, batting .246 (28x114) with sixdoubles, three triples, a home run and 18 RBI. Combined to hit .304 (151x496) with 88 runs scored, 32 doubles, seven triples, 13 home runs, 59 RBI and 33 stolen basesin 128 games with Single A Charleston, Single A Tampa and Scranton/Wilkes-Barre during the 2007 season to earn theKevin Lawn Award as the Yankees top minor league position player...Sidelined April 18-28 with a right hip strain...Batted .405 (15x37) over the course of a 10-game hitting streak April 30-May 10...Compiled a 12-game hitting streak May 23-June 4, batting .306 (15x49)...Transferred from Charleston to Tampa on June 22 -- posted a 16-game hitting streak July 1-17, batting .387 (24x62) with four doubles, two triples, four home runs and 11 RBI...Hit .357 (40x112) with eight doubles, three triples, six home runs and 16 RBI in 29 games during July -- led the FloridaState League with 72 total bases, while he was third with a .357 batting average and tied for fifth with six home runs...Transferred from Tampa to Scranton/Wilkes-Barre on September 2 -- saw action in one game before his contract wasthen transferred to Trenton on September 5...Saw action in eight games with Trenton during the Eastern League playoffs, hitting .200 (7x35) with a double and fourRBI as the club captured the league's championship...Named the second-best prospect in the Yankees organization and 10th-best prospect in the Florida State Leaguefollowing the season by Baseball America...Hit .271 (36x133) with 10 doubles, five triples, three home runs and 22 RBI in 39 games for Honolulu in the HawaiiWinter League following the season to earn league all-star honors. Selected to the South Atlantic League's mid-season all-star squad as he spent the entire 2006 season with Charleston...Led the South Atlantic League with 535 at-bats, while he tied for third with 134 games played...Hit .321 (27x84) with 20 runs scored, four doubles, a triple, home run and 12 RBI in 22 games during April...Named the 18th-best prospect in the Yankees organization following the season by Baseball America. October 29, 2018 CF Austin Jackson elected free agency. 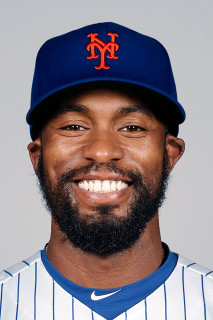 July 27, 2018 New York Mets activated CF Austin Jackson. July 14, 2018 Texas Rangers released CF Austin Jackson. July 11, 2018 Texas Rangers designated CF Austin Jackson for assignment. January 22, 2018 San Francisco Giants signed free agent CF Austin Jackson. November 2, 2017 CF Austin Jackson elected free agency. July 25, 2017 Cleveland Indians activated CF Austin Jackson from the 10-day disabled list. July 16, 2017 Cleveland Indians sent CF Austin Jackson on a rehab assignment to Columbus Clippers. June 27, 2017 Cleveland Indians placed CF Austin Jackson on the 10-day disabled list. Left quad strain. May 26, 2017 Cleveland Indians activated CF Austin Jackson from the 10-day disabled list. May 19, 2017 Cleveland Indians sent OF Austin Jackson on a rehab assignment to Columbus Clippers. May 2, 2017 Cleveland Indians placed CF Austin Jackson on the 10-day disabled list. Hyperextended left great toe. March 27, 2017 Cleveland Indians selected the contract of CF Austin Jackson from Columbus Clippers. January 25, 2017 Cleveland Indians signed free agent CF Austin Jackson to a minor league contract and invited him to spring training. January 25, 2017 CF Austin Jackson assigned to Columbus Clippers. November 3, 2016 CF Austin Jackson elected free agency. October 3, 2016 Chicago White Sox activated CF Austin Jackson from the 15-day disabled list. June 10, 2016 Chicago White Sox placed CF Austin Jackson on the 15-day disabled list. Medial meniscus tear in left knee. March 6, 2016 Chicago White Sox signed free agent CF Austin Jackson. November 2, 2015 CF Austin Jackson elected free agency. September 1, 2015 Chicago Cubs activated CF Austin Jackson. August 31, 2015 Seattle Mariners traded cash and CF Austin Jackson to Chicago Cubs for Future Considerations and Player To Be Named Later. May 26, 2015 Seattle Mariners activated CF Austin Jackson from the 15-day disabled list. May 16, 2015 Seattle Mariners sent CF Austin Jackson on a rehab assignment to Tacoma Rainiers. August 1, 2014 Seattle Mariners activated CF Austin Jackson. June 14, 2013 Austin Jackson roster status changed by Detroit Tigers. June 10, 2013 Detroit Tigers sent CF Austin Jackson on a rehab assignment to Toledo Mud Hens. May 13, 2013 Detroit Tigers placed CF Austin Jackson on the 15-day disabled list retroactive to May 12, 2013. Pulled right hamstring. May 12, 2013 Austin Jackson roster status changed by Detroit Tigers. June 9, 2012 Detroit Tigers activated CF Austin Jackson from the 15-day disabled list. June 7, 2012 sent CF Austin Jackson on a rehab assignment to Toledo Mud Hens. May 25, 2012 Detroit Tigers placed CF Austin Jackson on the 15-day disabled list retroactive to May 17, 2012. Abdominal strain. November 20, 2009 New York Yankees selected the contract of Austin Jackson from Scranton/Wilkes-Barre Yankees. April 5, 2009 Austin Jackson assigned to Scranton/Wilkes-Barre Yankees from Trenton Thunder.